Thanks to the exhausting work of Andrew to break through the system and with the support of other artists also wrongfully arrested a case was created and recently settled with the city this past April. You can read more in an article in Gothamist. 'BuskNY, an advocacy group for underground buskers, announced that the city has strummed up over $100,000 in settlements for the wrongful arrests of performers. Musicians and activists gathered in the Union Ave. station in Williamsburg, Brooklyn, Saturday to celebrate the milestone. Guitarist James Gallagher, 44, and his rapper partner James Woodard, 25, won a recent suit against the city for $54,500. Since 1985, music and art performances have been legal in the New York subway system — with no permits needed." Congratulations to Jadon, James, and Andrew for their hard work getting this news out there. On September 29th we lost Gina Glaser Higginbotham. She was a champion of the arts, of music in public spaces and certainly of keeping music alive and thriving in the subway stations of NYC. Gina along with her husband Tim (who still is tirelessly working as the MUNY consultant) started the Music Under New York program. What many people did not know is her own personal background as an incredibly talented folk artist in her own right. As I post this my heart is heavy for Tim and his family at the loss of their dear Gina. Gina in one of her favorite places in the world, Venice. I was always so excited to she her wearing one of my nycsubwaygirl t-shirts. Gina will be missed. As a member of MUNY since 1999 I was always in awe of Gina's ear and knowledge of music. 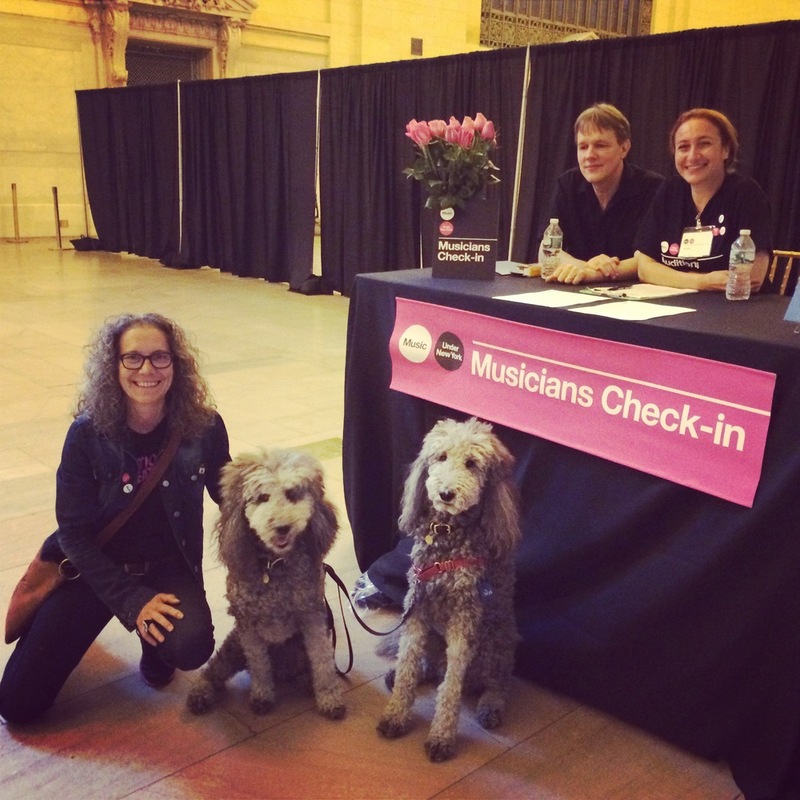 She championed music in public spaces and her tireless support for the program was clear every time we would connect during the annual audition process. Happy journey Gina. I have performed in the NYC subway's since 1999, I have met so many talented musicians. One of them, and honestly one of my favorites was Delta Dave. Sadly he died suddenly of a heart attack last week. I am mourning the loss of this incredibly talented artist, who always had a smile and performed some of the best Delta Blues I've heard in a long time. A quiet soul and to make him even grander, was wheelchair bound. I used to love to come across him performing in the W 4th corridor. One day I asked him what the lyric was he was singing, he replied "what can you do without earth and sky." indeed. RIP Delta Dave. I had the pleasure of capturing him on my little camera multiple times. Here is a clip I made of him a few years back. With sadness we announce the passing of our Delta Dave last month. Dave’s sound was founded in the Mississippi Delta and Chicago blues style. His vocals, harmonica and guitar playing while harkening to his influences Little Walter, Jimmy Reed, Lightning Hopkins and Howling Wolf… had their own rich authenticity. Dave performed around the world with a number of notable blues musicians - Honey Boy Edwards, John Hammond, Jr., Little Smokey Smothers, Louisiana Red, R L Burnside and more before forming his own band- the Delta Dave Blues Band. They recorded their 1st cd “Pignose Boogie” in Jacksonville, Florida. He later developed his own “one man band” performing set-up. In 2005 we were pleased to bring Delta Dave onto the Music Under New York roster. Over the years his unique, robust style and good will have been instrumental in the continuing heritage of the blues, as well as the stature of our program. Delta Dave you are dearly missed but we hear you clearly from the great beyond! You've most likely heard about U2's surprise busking in Grand Central at the Shuttle location. While it's awesome they did this, let's not forget they are rich rock stars. The performers to celebrate, are the 100's of artists who perform every day never sure how much money they'll make. Buskers are keeping live music thriving in ways that recordings and record company support isn't doing. I am always saying it's a rush to busk in NYC and stage performers should try it at least once. Let's keep this in perspective. And I hope Jimmy Fallon starts a segment where he goes around the city showcasing the amazing talent there is. A reminder, here's the clip I made celebrating over 100 buskers in NYC whom I filmed throughout last year (including yours truly at the Shuttle). I am all about supporting Busking. NYCSubwayGirl has a For Buskers section where I share useful information about busking in NY. City Lore and BuskNY have been incredible supporters of the right to Busk. I hope you can make it to this event celebrating 30 years legal precedent for the First Amendment right to Busk. The April 2nd event is the beginning of many celebrations to come throughout the year. 7pm start time. Doors at 6:30pm. With the recent rise in street performer arrests and harassment, Busking at 30 aims to highlight the importance of this underground culture and what it brings to the diverse and vibrant culture of New York City. The program will feature a history of busking in New York City through vignettes and songs from historical performers of the 1980s, 1990s, and 2000s, as well as a headline performance by one of the subway’s biggest stars, Morgan O’Kane , banjo virtuoso and activist. Other performers include Busker Ball producer Theo Eastwind ; classical guitarist Lloyd Carew-Reid, whose advocacy group Subway Troubadours Against Repression led the MTA to formally address performers’ rights in its post-1989 rules; and Roger Manning , the guitarist whose historic 1985 legal challenge opened the subway to artistic performance. 30 years after the first case to explicitly recognize New Yorkers’ First Amendment right to artistic expression in the subway, BuskNY and City Lore are pleased to announce Busking at 30: Sounds and Stories from the Underground, an evening that celebrates and advocates for the enduring art form that has long given voice to the city’s wealth of musical traditions and genres. Busking at 30 is the first in a series of events leading up to a summer busking festival in celebration of the August anniversary of the People v Manning case, which was the first step in the legalization of subway performance that culminated in 1987. It's time for the next Music Under New York Auditions. Here is a link to the 2015 Application. I've been a proud member since 1999 and look forward to seeing the auditions held each year in Vanderbilt Hall of Grand Central sometime in May. A fantastic year of capturing buskers in New York City including having the camera turned toward me while I perform and spontaneously jam with others. Check it out and please share. What we do matters. What inspires buskers? Music, People, Life, Hot Chocolate, Snow, Love Stories, People of New York! This is a perfect example of Music and Art in public spaces. I love to share great things that occur anytime subway musicians are featured. Here's a wonderfully executed video clip by film maker Chris Shimojima of subway performers stationed in nine different locations synced by wi-fi and conducted live in Bryant Park by composer LJOVA. Amazing. I am happy to know many of these musicians. We are so lucky to have such talent performing in the stations and public spaces of NYC. I was recently approached by fellow Music Under New York artist Luellen Abdoo who asked me to film a short music video of her. Still dizzy with excitement from my recent Chain Film Festival Best Documentary Web Series win, I was happy to put my energy into a fun video like this. The first screening of my films was last night. It was a fun night of meeting other film makers and seeing great films with an NYC theme. The next screening will be Thursday August 14, at 9 PM of my Documentary Short film, The Inspiration Project, and Web Series selection, Music Under NY Auditions 2013. The Official Selection versions are below and you can rate them on the Chain Film Festival website, see the links below each clip. Even if you can't attend the screenings in person, I invite you to share with your friends and family. I want to thank everyone over the years who has answered the question, "What Your Inspiration?" and in doing so, motivating me to continue asking and finding beauty in spontaneous interactions with passersby. This project would not be possible without you all. Grand Central Terminal is bustling with 1000's of commuters each day. Inside the station is a wonderful market, little shops, a fun informative Transit Museum, a lower level food court, and just a fun place to people watch. Every Monday in July from 11-2pm and 4-7pm Vanderbilt Hall will be a place for Free tastings, special offers and more from Grand Central shops and restaurants with Music provided by Music Under New York artists. I perform today July 7th from 4-7pm. Come by for a unique experience. Even if you miss me today, come by on Monday's to see the charm of Grand Central Terminal. Here's the link for the schedule of Music Under New York artists for the event. Make Music New York: 1000+ Concerts. One Day. Five Boroughs. Above + Below Ground. On June 21, 1989 I flew from NYC to Paris, France. When I landed, I found myself in the midst of an uproarious yet melodic commotion that I'd never known. It was the "Fete de la musique," an outdoor festival of music held on the longest day of the year, the summer solstice. I am happy to be a part of the festivities this year on this side of the world. New York City is always full of music, life and song, to imagine it more magical is nearly impossible. However, for the past eight years, Make Music New York has taken our magical chaos to whole new level. This Saturday, June 21, Make Music New York returns to celebrate the beginning of summer with over 1000 concerts and music performances throughout the five boroughs. Public parks, sidewalks, venues, block parties and music schools, are just some examples of where you will stumble into a magical musical experience. And as always, the underground will be bustling with music. For the above-ground schedule check out Make Music New York's website. For underground schedule, Here's the list of Music Under New York performances this Saturday! Please pass along to your friends. I'll be using #MMNYBuskers to share spontaneous performances from the underground throughout the day. Here are a couple of busker friends with above-ground gigs on Saturday! SisterMonk performs @ 6:15 PM at the East River Park Bandshell-Music all day, (SisterMonk a Music Under NY member, will perform at three different venues during the festival in Brooklyn and Manhattan) Here's a clip I recorded of them in the underground at Grand Central Station Mezzanine. Mariachi Flor de Toloache, the all female mariachi band, will perform at Dag Hammarskjold Plaza- 346 E. 47th St at 1pm. Below is a clip I made of their Music Under New York audition. And here's a little something for aspiring musicians and future buskers! Music is such an important part of all of our lives whether we realize it or not. I hope you get out and enjoy all that Make Music - Fete De La Musique has to offer where ever you live. I have been performing in the New York City Subway for years and in doing so, I have become a member of an amazing and talented community of performers and musicians. We are scattered out on platforms and stations and spidering throughout the city. The heart of this community pulses through the transit system, streets and parks. I am drawn in as much as any passerby when I hear an instrument or see a crowd forming, but I join the viewers with a deep sense of pride. I love this community I have become a part of and I want to share their spontaneous and moving performances with the world. I have compiled many clips of buskers throughout my years and have compiled a Busker Video Gallery on my website. Each week I put up a new "Featured Artist," and continue to add to the gallery of my community. This week's Featured Video is doo-wop group The Chosen Voices performing "Twisting the Night Away." On the day I filmed this, they were getting off one car and about to jump on the next when they saw me and shouted out "Hey SubwayGirl!" I called for them to come over and sing for me and they did. These are the spontaneous moments that are so precious to me. Fellow buskers should feel empowered to share my videos on their pages and with their fans; or you can send me videos and I will add them to the gallery. I have also compiled a list of buskers and their websites. If you find a mistake or you are a busker looking to be added to the list, please email me. For those interested in busking in New York City, I have extensive information about rules and regulations of MTA, NYC, and information about the Music Under New York program here. The 2014 Music Under New York new artists have offically been announced. Find them here. Great job to all those who auditioned. At the 2014 Music Under NY auditions, they unveiled a new design for the program created by the acclaimed design firm Pentagram I'm excited to be one of the artists chosen to give the new look a try. When I arrived at Columbus Circle, Kora player Salieu Suso (also in the MUNY program) was performing. I met La Mont Young aka Lucky Luck Gets, who demonstrated to us how to store the new banner. "You put a spin on it and then a bend on it." For any MUNY artists out there here's a pretty good tutorial on how to store the banner. Salieu got it in one try. During the annual Music Under NY auditions, I had a visit from my pups Etta and Lily, with MUNY artist Nalalia Paruz The Saw Lady. You can see the new design and branding of the Music Under NY. I wore black with pink not even knowing that that was the new color palette. Synchronicity! I performed at Grand Central Shuttle after the auditions and I was very proud that MUNY invited me to be the first to showcase the new MUNY logo. Let me know what you think.